We have used the name "flowering plant" in a restricted sense to save us using a scientific word. We mean by it all those seed-bearing plants that do not belong to the Coniferous or Pine family. They are not the only plants possessing flowers, but they are the only ones that bear the conspicuous forms that in ordinary talk are called flowers. This large group is formed of two well-marked and quite distinct sections. All forms hitherto treated belong to the Dicotyls; the subjects of this and the next chapter belong to the Monocotyls. It is not easy to define the difference between the two. If you germinate a seed of the first, such as Eucalypt, Cabbage, Pea, it may be seen that a pair of leaves first show above the ground; these leaves are very apparent in the seed; they are called cotyls, so the section gets its name from this fact. Amongst the other plants no such regularity appears. The leaves appear in succession, and it is rather an assumption that they possess one cotyl. The practical way of distinguishing is by examination of the parts. In Dicotyls the leaves have generally netted veins, and the parts of the flower in fours or fives. In Monocotyls the veins are usually parallel, and the parts of the flower in threes or sixes. No rigid rule, however, is apparent, but with a little experience there is no difficulty in correctly placing a plant. Palms, Orchids, Lilies, Sedges, Grasses, and such are Monocotyls. 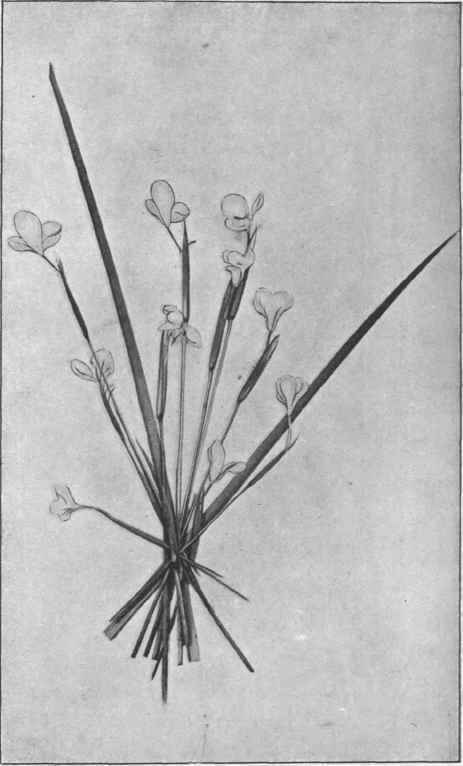 Of these, some have conspicuous flowers; others, like Grass and Sedge, obscure ones; but all tend to the one type, which may be best understood by examining a Lily. The Lily family is a large one, and found throughout all habitable portions of the globe. It is a well-marked group, though it passes without break into the Rushes. Blackboy, also called Grasstree - a name apt to confuse it with the other Grasstree, Richea - is on the border of the two, being placed by some in one family, by others in the other, and with equal justice. In a typical Lily there is no doubt. In Rush the perianth is greenish, hard, and obscure; in Lily it is delicate, and coloured or white. We have eighteen Lily genera, but most are not often met with. There is considerable difference in their perianths, which may be made up of separate parts, or may be variously combined; but it is always attached below the ovary. The stamens vary in structure, and these differences, often slight, are made use of in classifying them. There is also difference in pistil and fruit. Dianella is our commonest form, and is found in all parts. It grows in a tuft with long narrow leaves, which are often recurved on the margin. The flowers are numerous, in erect, spreading inflorescences. They are always blue, and generally dark. The fruit is a small dark-blue berry. The perianth is formed of six nearly equal parts, that are but slightly united to one another at the base. They are in two circles, each of three parts, and may be called calyx and corolla if you wish. They are longitudinally lined in the centre with three to seven parallel lines. 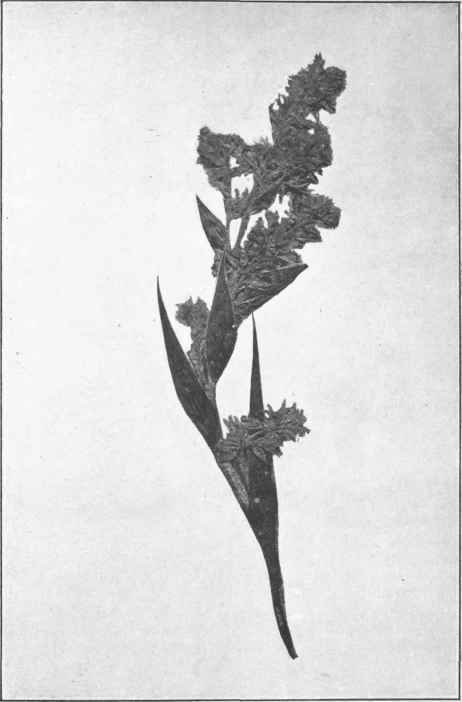 After flowering the perianth gradually withers and falls off. There is no good popular name. Sword Lily is also used for other plants; Blueberry confuses it with Blue Climbing Berry. The stamens are very interesting; there are six, and their anthers are long and usually discharge the pollen through a terminal pore. The filaments have a peculiar thickening that commences close under the anther and extends a longer or shorter distance, according to the species. Stypandra is a small densely-tufted plant, with grassy leaves, common in heathy places. The flowers are few or many, and arranged about the same level; usually pale-yellow, sometimes blue. The perianth is very much as in Dianella, but twists round the fruit after flowering. The anthers are small, and coil backwards after flowering. The filaments are long, slender, flexed, and covered with minute papillae. The fruit is fleshy. Gordon River Lily belongs to the genus Milligania. It grows in the water of some western rivers. The leaves are long, narrow, and flat, and the flowers are cream-coloured and numerous, in spreading masses, growing on a tall stalk. A second species of the genus is found on the mountain plateaux, from Mt. Hartz to the west. Blandfordia is a very showy plant. The perianth is an inch long, crimson, tipped with yellow; it is tubular, gradually expanding, with six lobes at the end. There are numerous flowers arranged along on erect stalk. Rock Lily grows in grass as well as upon almost bare stone. It is very like an onion in form of leaf, but the numerous flowers are yellow and arranged along a tall stem. There are two species very alike, only one has a ring of fleshy hairs on all six stamens, the other only on three of them. Milligania Densiflora, Hook. 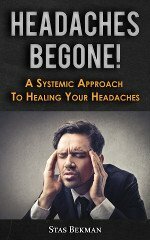 [See p. 98. Star of Bethlehem has white flowers in a loose terminal head, so arranged that all the flowers are placed about the same level. The fruit is a three-angled capsule. Turquoise Berry, also known as Solomon's Seal, is common in woods. It is not far removed from Solomon's Seal of Europe, and is similar in structure. The main stem travels along underground, sending up every year an erect branch. 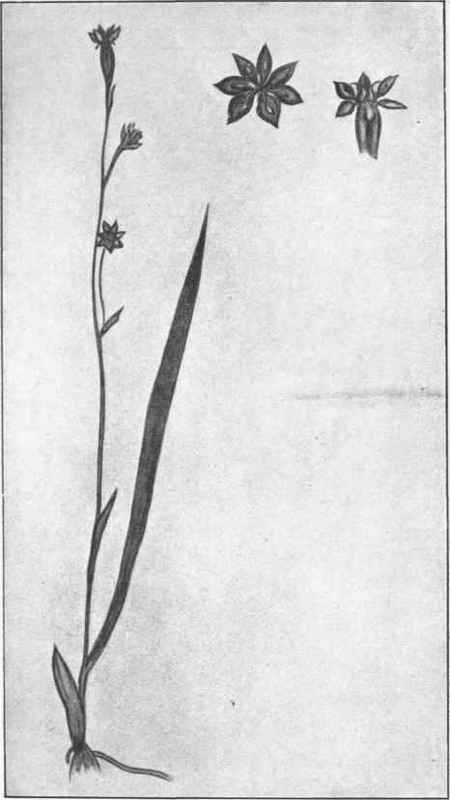 This is slender, and towards the end there are lance-shaped leaves in two rows. The end tends to nod, and pendent below the axils are little pale flowers. The fruit is a little turquoise or white berry. We have but few Irises in Tasmania, but they make up for that by being very varied in structure, and are therefore of great interest to the botanist. We have no members of the Iris genus in Tasmania. What is meant here is the Iris family. 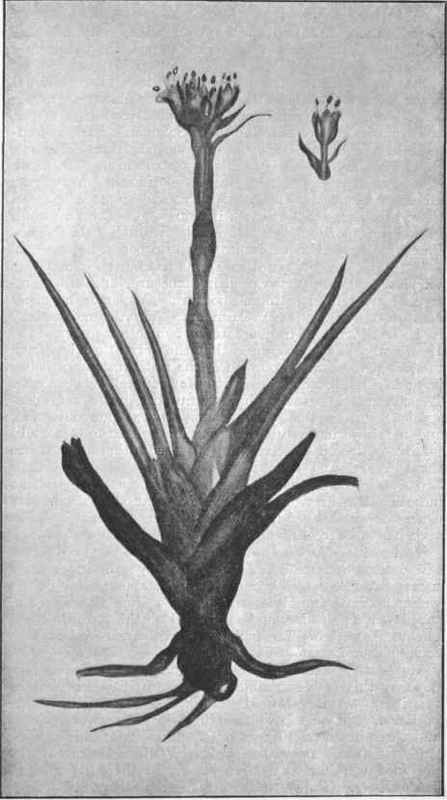 The character by which a member of the Iris family may be known is that the perianth arises from the top of the ovarian portion of the pistil instead of below it, as in Lily, so that the fruit is formed below the flower. The stamens are usually three in number, but a more constant feature is that the anthers always open outwards, and not inwards, as in allied families. In the Amaryllis family, of which we have few members, the stamens are three or six, and open inwards. Our White Flag has a horribly long name, Diplarrhena moroea. The first or generic name means two stamens, a character of the genus; and moroea means that it looks very like a Moroea, which is a South African genus. White Flag has six perianth segments in two series. The outer three are broad and spreading; the inner three narrow and erect. There are three stamens, but one is rudimentary. The style, which arises from the centre of the flower, is slender, and is divided at the top into three unequal branches. The fruit is a three-chambered capsule, each containing many flat seeds. In heathy country we often find an Iris with blue flowers; this is remarkable for the rapidity with which it withers when gathered. It has a long tube to the perianth, and on top of this three broad spreading lobes and three inner small erect ones. It is Patersonia glauca. The first name immortalises Colonel William Paterson, who did good work in Australian botany in the early part of last century. Glauca means a blue-grey colour. On some of the mountains of south-west Tasmania there grows a very interesting, member of this family, known as Hewardia tasmanica. Neither it, nor anything like it has been found anywhere else. 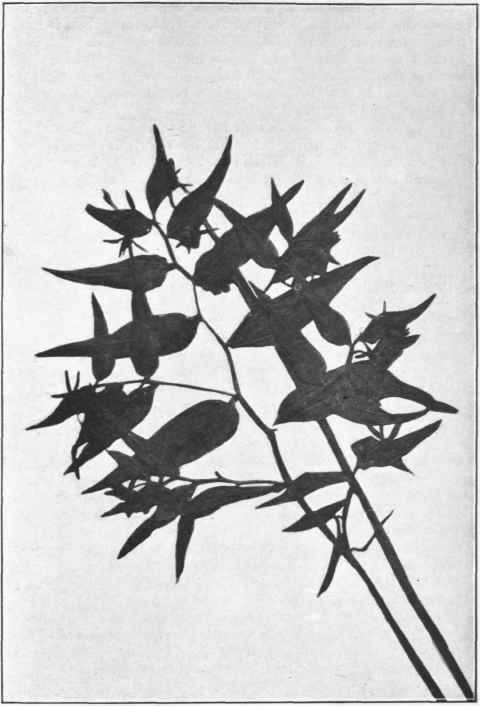 The leaves are flat, narrow, 3 or 4 inches long, and, as common to the family, are arranged in two rows. The flower is dark purplish-brown or yellow, of six nearly equal perianth divisions, each about an inch long, and reflexed when fully open. It has the typically three outward opening stamens, but the ovary, instead of being below, is nearly quite free above the perianth. This is a remarkable survival or peculiar reversion, but does not warrant the plant being placed amongst Lilies. 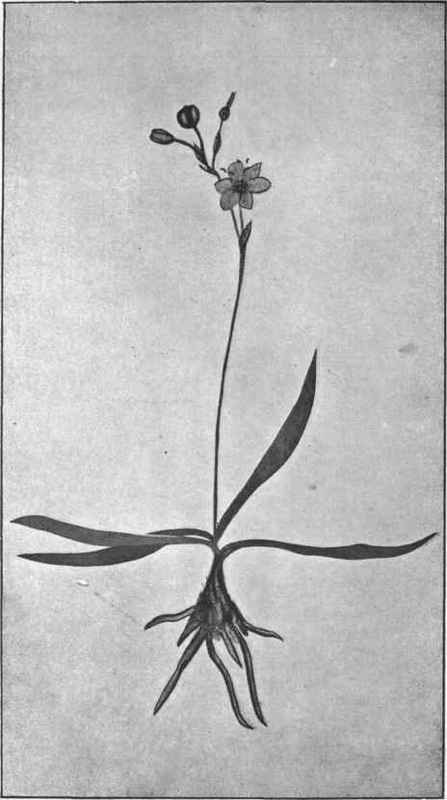 It was common once to style the Dicotyls the higher flowering plants, and Monocotyls the lower, and to consider the latter as primitive in time as well as in structure. There is no warrant for this. They are two parallel lines quite independent of one another, that probably diverged from a common ancestor, but how and when we have no record. There is no reason to suppose that Dicotyls have been derived from the other; on the contrary, there are some points that might lead us to conclude that the Monocotyls are the more recent, and a reduced offshoot from the Dicotyls.